One industry secret to getting serious deals on big time bats is finding a blem bat. These bats are just what they sound like—functional but with a blemish, usually a cosmetic imperfection that occurred in the factory. There are typically NO warranties on these bats, although they do come new in wrapper. You can find both wood and aluminum/composite bats in the blem department. Aluminum and Composite blem bats are more difficult to come by simply because few manufacturers produce their product in the USA. Overseas manufacturers most often do not let cosmetic blems out of the warehouse. 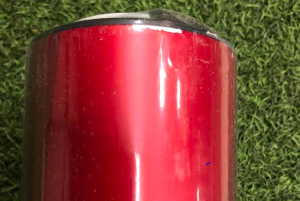 However, you can find an occasional blem in Marucci and maybe Rawlings at major online vendors. The most common types of blems on the market are DeMarini bats. This is because DeMarini produces their bats in the states. Major vendors often get these as well, and you just have to be vigilant to find them. 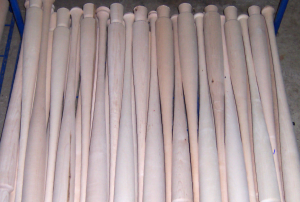 Wood bat blems are much more common because most wood bat manufacturers produce their wood bats in mill shops within the US. When they find some wood grain that isn’t just right or mess up on anything from graphics to exposing an odd shaped knot, they go in the wood pile. You can often find a number of blem wood bats on sale on eBay. Occasionally too, major vendors will buy out a manufacturer’s cosmetic wood blem supply and sell them on their site. What does Blem on a Bat Mean? In the composite or aluminum space a blem bat refers specifically to a cosmetic blem. Meaning, a bat comes with some issue with the aesthetic value of the bat, including chipped paint, off-set logos, wrong colors and more. These are rare but, when found, come at a considerable discount (and no warranty). A wood bat blem might refer to a cosmetic issue or a more structural issue with the bat. It is not uncommon for a wood bat lathe to misappropriate a bat’s wood. As well, several knots or dark grain spots are unrecognizable until they’ve been through the lathe. Each imperfection leaves these bats in the blem pile. Unfinished wood blems can be found on ebay by the truckload. 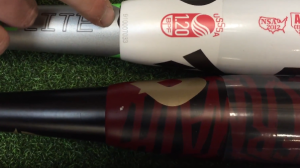 There are no major tricks to finding DeMarini blemshed bats other than persistence. We have seen most success by checking the demo bat section of a place like closeoutbats. Otherwise, check eBay with a search like this. You might also find success using the terms ‘demo,’ instead of ‘blem,’ in your search. Demo bats are not technically blems because they have been used, but in terms of price point and no warranty, they are similar. Many major online retailers have some selection of Louisville Slugger wood bat blems. Finding the aluminum and composite blems are almost impossible. (As we state in the beginning of this article, bat companies with manufacturing overseas rarely have aluminum and composite bat blems in the states).